This collection of short stories by Mackey Chandler is FREE TODAY ONLY! A collection of seven Science Fiction short stories by Mackey Chandler. 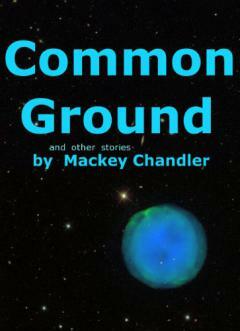 The lead story, Common Ground is big enough to be a novella. It was published in Jim Baen's Universe e-zine. Sadly that has gone out of business. They had a goal of paying professional rates which made it more difficult. I'm somewhat spoiled because this was the first short story I ever attempted and it sold. I won't ruin your read with detailed spoilers - sufficient to say the seven shorts contain an alien with a very human foible, a joker Joyboy banished to selling shoes on the moon, a crotchety old man holding aliens at bay with a leaf blower, the ultimate Windoze -FAIL-, a self made billionaire who never lost his touch, a sword wielding Earth diplomat who was either very very good or incredibly lucky, and a future Mama's boy dealing with family in an era of extended life times.